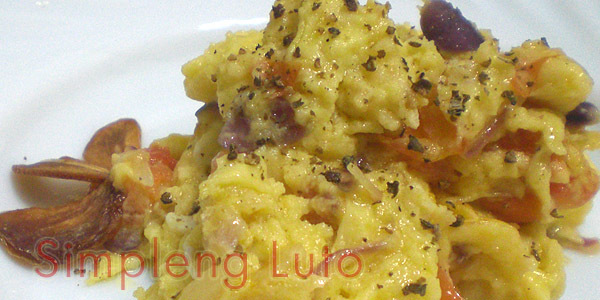 As usual there are many ways how to prepare egg dishes, specially scramble that most of us like in breakfast. One time I taste a so simple scramble egg in hotel restaurant and it is moist and fluppy with a lot of tomatoes in it. Suete garlic, onion, and tomatoe. Smash and cook well tomatoes. Pour in scrabled egg and mix in a low fire. Do not over cook it is good to serve while it is moist. Serve in plate and sprinkle cracked pepper or powder pepper.